The need for and the existence of contracts seems to have grown in recent decades. Back in the old days, there were few written business contracts, and many business and personal deals were done with a handshake. If a problem arose, the two parties could take the issue to court, and a judge would hear the case even if the contract was not put into writing. Today, although a verbal contract is still legal (except for specific situations), most contracts are documented in written form. Contracts have become increasingly detailed these days, and every effort is made to make all possibilities and eventualities clear. In addition to being clear and specific, a contract must meet certain criteria to make it legally enforceable. A legally enforceable contract can be used in court to support a decision on a disputed item. If a contract does not have certain essential ingredients, it is not legally enforceable. Most contracts never see a courtroom and they could easily be verbal unless there is a specific reason for the contract to be in writing. When something goes wrong, a written contract protects both parties. If one party to a valid (enforceable) contract believes the other party has broken the contract (the legal term is breached) the party being harmed can bring a lawsuit against the party who it believes has breached the contract. The legal process, or litigation, determines whether the contract has been breached or whether there are circumstances that negate the breach. The court, however, will only hear a contract dispute if the contract is valid. Many people use the terms contract and agreement interchangeably, but they are not precisely the same thing. Black's Law Dictionary defines an agreement as "a mutual understanding between...parties about their relative rights and responsibilities." It defines a contract as "An agreement between...parties creating obligations that are enforceable." There are six required, essential elements for a contract to be valid (enforceable by a court). The first three, considered here together, relate to the agreement itself, and the other three relate to the parties making the contract. 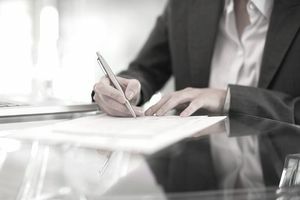 Offer, Acceptance, and Mutual Consent: Every contract must include a specific offer and acceptance of that specific offer. Both parties must consent of their free will. Neither party can be coerced or forced to sign the contract, and both parties must agree to the same terms. Implied in these three conditions is the intent of the parties to create a binding agreement. If one or both parties are not serious, there's no contract. Legal Purpose: The contract must be for a legal purpose. It cannot be for something illegal, like selling drugs or prostitution. Remember that it is not illegal to enter into a contract that doesn't have all of these essential items; it just means that if an essential is missing the contract cannot be enforced by a court. As noted above, verbal contracts can have the force of law, but some types of contracts must be in writing, like long-term contracts and contracts for marriage (pre-nuptials). There is also such a thing as an implied contract. You can unknowingly enter into a contract with someone and be forced to abide by its terms.